Manish N. Shah, MD, is fellowship-trained in pediatric neurosurgery with special expertise in pediatric epilepsy, craniofacial and craniocervical spine surgery. He is also an expert in the surgical management of spasticity and dystonia in children, and performs selective dorsal rhizotomies, baclofen pump placements and advanced deep brain stimulation. An assistant professor in the Department of Pediatric Surgery at McGovern Medical School at UTHealth, Dr. Shah earned his undergraduate degree in physics at Princeton University and his medical degree at Vanderbilt University in Nashville, Tennessee. He completed his residency in general surgery and fellowships in neurosurgery at Barnes-Jewish Hospital, Washington University, St. Louis, Missouri, and pediatric neurosurgery at St. Louis Children’s Hospital in St. Louis. He received a clinical research award in 2009 and a medical student teaching award in 2010. At Washington University, Dr. Shah learned the surgical treatment of spastic diplegia with selective dorsal rhizotomies from one of the technique’s pioneers, Dr. Tae Sung Park. He is an author of research articles published in Proceedings of the National Academy of Sciences, Journal of Neurosurgery, Neurosurgery, Neurosurgical Focus and Journal of Neurosurgery: Pediatrics, as well as a book chapter entitled “Congenital and Acquired Abnormalities of the Thoracic and Lumbar Spine,” published in Youmans: Neurological Surgery. He is a member of the American Association of Neurological Surgeons and the American Association of Neurological Surgeons/Congress of Neurological Surgeons’ Joint Cerebrovascular Section and Joint Pediatrics Section. Dr. Shah is amazing and one of the very Best! [...] has a great team of doctors at UT Physicians!! Dr. Shah is an amazing person... Not only is he an excellent Neurosurgeon, he is also a very caring individual that only wants what is best for my son. He is honest, caring and very devoted to my son and his treatment. Because of professional physicians, like Dr. Shah, I believe my son has the best quality of life possible. Dr Shah is awesome, amazing and very friendly. Dr. Shah is a great neurosurgeon and he genuinely cares about what's going on with the patient. 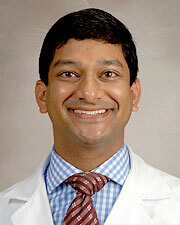 We love *Dr. Shah, and hope that he never leaves UT Physicians. He was kind and intelligent. He took time to explain the situation and made a decision about care, but did not explain the decision or future care. Minimized our concerns. Said we should be grateful situation was not worse. We don't really understand how this plan of care is supposed to help. And we don't have faith that it will. his lack of eye contact with myself and daughter made her uncomfortable. Resilient teen is not letting cerebral palsy impact her goal of walking unaided. Read about her story and the people supporting her along the way.